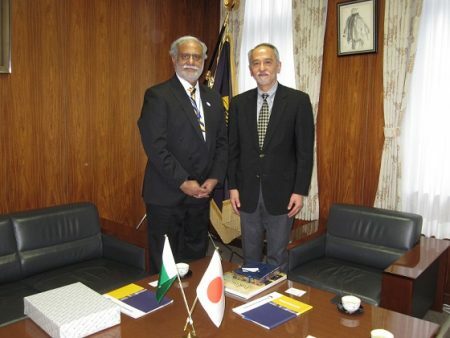 On January 19, 2017, Dr. Tayyeb Akram, Director of the Wah campus of the Commission on Science and Technology for Sustainable Development in the South Institute of Information Technology (COMSATS CIIT), paid a courtesy visit to President Shinji Harada. COMSATS CIIT is Pakistan’s first institute of information technology. In 2000, the Institute was given a charter from the government of Pakistan and is regarded as a higher education institute that provides high quality education in Pakistan. The CIIT has eight campuses in seven cities, with more than 35,000 students and 2,887 faculty members. It offers undergraduate programs and graduate programs for master’s and PhD degrees not only in information technology but also in engineering, basic sciences, business administration, and architecture. The courtesy visit came to be realized through the adoption of an exchange program between Kumamoto University and the CIIT for the Japan-Asia Youth Exchange Program in Science: Sakura Exchange Program in Science* run by the Japan Science and Technology Agency (JST). 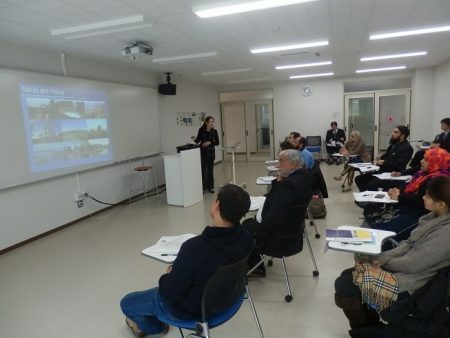 Ten scholars including Prof. Akram and students visited Kumamoto University. At the meeting with President Harada, thoughts about the possibilities for future academic and student exchange activities were shared and the courtesy visit ended harmoniously. We hope that this visit opens up more opportunities for interaction between Kumamoto University and the CIIT. * JST Sakura Exchange Program in Science: A program to increase interest in Japan’s cutting-edge technologies and contribute to the cultivation of talented individuals and development of science and technology in Asia and Japan by having intelligent young people in Asia visit Japanese universities and research institutes to interact with relevant faculty members, staff, etc. From the first application project in 2014 to the third in 2016, 28 total proposals were made by Kumamoto University and adopted by JST, the fourth highest (among all public and private universities) in Japan. 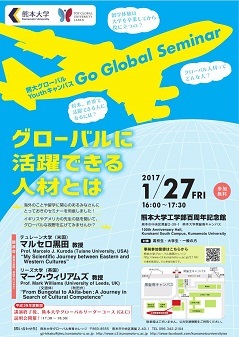 Kumamoto University will be holding “Go Global Seminar” as an event of KUMADAI Global Youth Campus. We invite you to the event, as shown. If you would like to apply, please click on the following link to register. 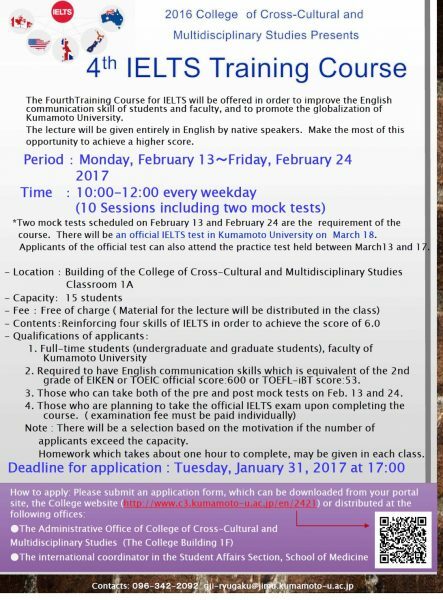 The College of Cross- Cultural and Multidisciplinary Studies calls for applications to the fourth IELTS Training Course of Academic Year 2016. Please refer to the poster attached, and apply according to the procedure. The deadline is Tuesday, January 31 at 17:00.